SO easy to set up, and adjust for height... comfy as they come... The "just right" economy bench for that digital grand... perfect size to pack up and run to a gig.... perfect! Quality is better than expected for the price. 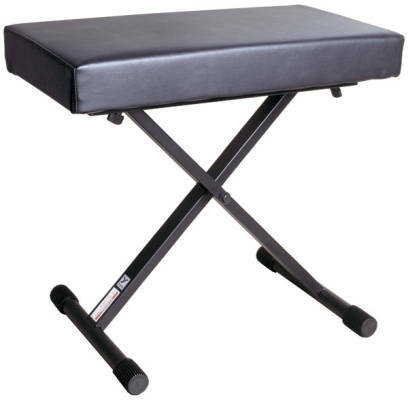 I needed a bench that goes up to 24 inches high, because I have an organ bass pedal board, so my legs have to be "hanging" a bit. This bench is perfect for that with its adjustable height. Excellent quality overall, very sturdy, folds flat for transport, and low price. I have been using this bench regularly when doing sit down gigs for over ten years. Work perfectly. The bench is strong and will not collapse unexpectedly. The covering material is not leather but has stood the rigours of time. An option for a carrying case is not easy to find. I had one made by a local sail maker. Really like this bench. My young daughter and myself both like to play piano and we needed something adjustable. The lowest setting on this one is 19" and it goes up three or four inches for her. It's also wide enough that you can slide an octave up or down (left-right). Seat is very firm thick foam. Stable for an X-frame design too. Won't break the bank.